THE BIGGER THE CHALLENGE, THE GREATER THE REWARD. IF YOU HAVE WHAT IS TAKES TO GRADUATE FROM THE KSP ACADEMY, YOU'RE BEGINNING A CAREER WITH UNIMAGINABLE OPPORTUNITIES. 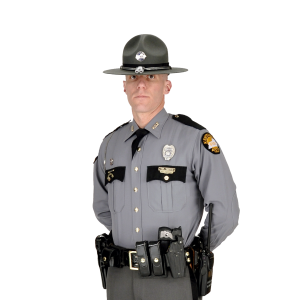 The Kentucky State Police Academy is an intense, 24-week military environment designed to teach our Cadets the job skills necessary to perform the duties of a Trooper. Those selected to attend our Academy will receive more than 1,000 hours of training covering all aspects of law enforcement, including Firearms, Defensive Tactics, Criminal Investigations, Emergency Driving, Strategies and Tactics of Patrol Stops (STOPS), Counter-Ambush, and more. Cadets are paid and receive benefits during the Academy. All equipment and agency clothing are issued. Meals and living arrangements while assigned to the Academy are provided by KSP. Minimal expense to the Cadet is required prior to beginning your career. Many job opportunities await you after graduation. 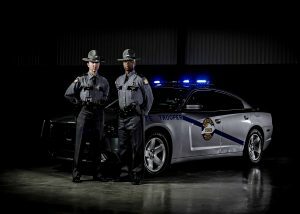 The career of a Kentucky State Trooper can be as exciting and as fulfilling as you wish to make it. Being able to wear the uniform and the campaign hat represent something special. Being a Kentucky State Trooper means being held to a higher standard. It represents something greater than yourself. It’s a family. It’s a way of life. We welcome you into our agency and wish you well throughout your career. However, regardless of the path your career takes, it all starts at the Kentucky State Police Academy. Of good moral character and in good health. Not less than twenty-one (21) years of age. Possess a valid driver’s license against which no more than six (6) driver demerit points have been assessed. You must submit a copy of a valid driver’s license at time of application. At the time of application, possess a minimum of a high school diploma or GED and three years of full-time work experience, or sixty (60) semester hours of credit from an accredited college or university, or be a high school graduate with at least two (2) years of active military duty or two (2) years of experience as a full-time, sworn law enforcement officer. An applicant does not meet any one (1) of the qualifications for appointment as an officer. An applicant has made a false statement of material fact on the application or in response to any questions or requests for information during the selection process. An applicant has used or attempted to use political influence, coercion or bribery to secure an advantage in any phase of the selection process. An applicant has cheated during the course of any examination required during the selection process, or has attempted to gain an advantage over other applicants by any dishonest or intentionally misleading act or omission. An applicant has failed to comply with any instructions from the agency relating to the selection process. An applicant has been dismissed for cause from any public agency, or has resigned while charges of misconduct were pending. An applicant has been convicted of a felony or a crime of moral turpitude. An applicant is a current user of a controlled substance, unless prescribed by a physician. An applicant is addicted to any controlled substance or intoxicant. An applicant has more than six (6) driver demerit points against his operator’s license. An applicant tests positive for an unlawful controlled substance as determined by a blood or urine analysis. An applicant has tattoos that can be seen when the applicant wears a Kentucky State Police summer uniform shirt, which the Kentucky State Police will make available for the applicant to try on when the applicant takes the written examination. Agency policy requires that tattoos or body piercings shall not be visible while in any agency issued uniform. Cadet troopers will receive $2,870.16 per month during academy training. Upon graduation, this salary will increase to $3,157.18 monthly ($37,886.12 annually). Troopers receive a 10-percent salary increase with each promotion. Troopers also receive seven dollars per day for uniform maintenance. Troopers also receive a $4,000.00 annual training stipend (effective August 1, 2016). Health Insurance: Troopers may choose one of a variety of health insurance plans offered with dependent coverage at additional charge. Life Insurance: The Commonwealth of Kentucky provides a $20,000 term life insurance policy. Vacation: Paid vacation time is accrued according to years of service. 0-4 years of employment: 12 days per year. 5-9 years of employment: 15 days per year. 10-14 years of employment: 18 days per year. 15 years or more of employment: 21 days per year. Sick Leave: You accrue one sick day for every month worked. You can accumulate up to one (1) year of sick time. Military Leave: Any trooper who is a member of the military reserve or National Guard is entitled to a maximum of 21 working days per year of paid military leave. All troopers are provided uniforms, necessary weapons, vehicles and other essential equipment and supplies to perform their duties. After 25 years of service, employees are eligible for disbursement from their Kentucky Retirement System contribution plan, either in a lump sum or a monthly payment. Additionally, retirees receive a monthly allowance to apply to their health coverage based on their years of service. Merit Pay Program, Job Security, State Run Deferred Compensation program, Opportunities for Growth and Advancement, and Take home car are also provided.